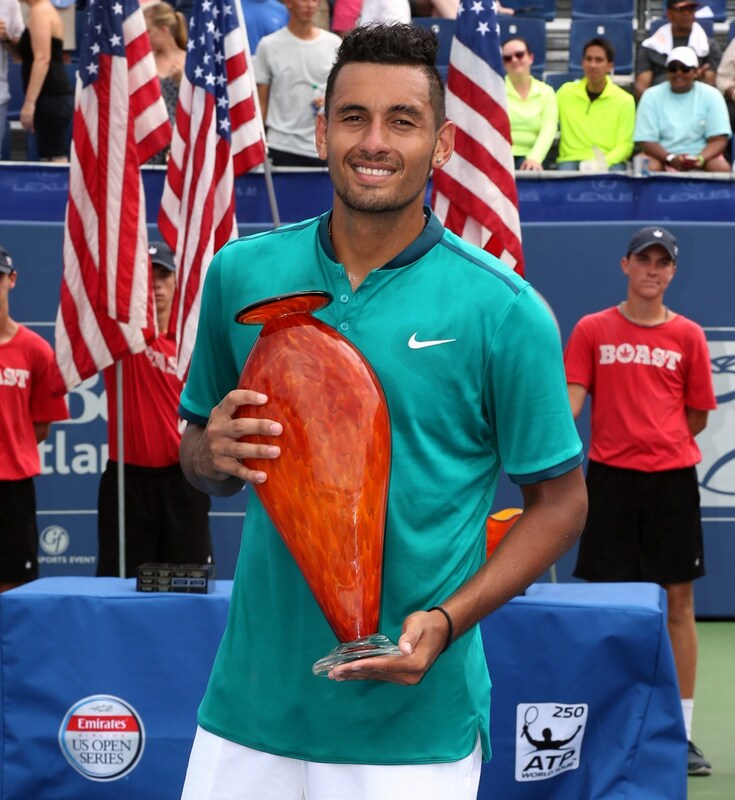 ATLANTA, June 12, 2018 – 2016 BB&T Atlanta Open singles champion, Nick Kyrgios of Australia will return to Atlanta and Atlantic Station for the 2018 edition of the event, to be held July 21-29, 2018. BB&T Atlanta Open Tournament Director, Eddie Gonzalez, made this announcement at BB&T Atlanta Open Media Day, on June 12. Kyrgios, 23, is currently ranked No. 24 in the world. In addition to his 2016 title in Atlanta, he won the 2018 singles title in Brisbane. In 2016, he also won on the hardcourts of Tokyo and Marseille. His career high ranking is 13. "I look forward to returning to Atlanta for the 2018 BB&T Atlanta Open,” offered Kyrgios. “I was disappointed last year, when I couldn't defend my 2016 title due to injury, but I look forward to once again seeing my fans and the friends I met during my stay in Atlanta." Kyrgios felt right at home in Atlanta. "Atlanta is just a great sports town and I feed off that. I felt the support of the sold-out Stadium crowds and can't wait to spend another week in Atlanta at a great venue in Atlantic Station and in front of passionate tennis fans." Defending champion, John Isner (world ranking No. 10) and top American players Jack Sock (world ranking #14) and the Bryan Brothers (former world ranking #1) will once again return to the event that kicks off the annual US Open Series. They join a new mix of young upstarts and current ATP World Tour top-60 players for the 2018 event. Gonzalez loves to call the BB&T Atlanta Open a “Mini U.S. Open” and that has never been evident than in 2018, when a US Open Women’s Singles Final rematch will occur with Americans, Sloane Stephens and Madison Keys playing at night on July 22. Last year, a sold out crowd enjoyed Venus Williams and Genie Bouchard playing the feature exhibition match, showcasing some of the best women’s tennis has to offer. 2018’s men’s field features two top-20 players, 2016 champion and crowd favorite, Nick Kyrgios, the most decorated doubles team of all-time in the Bryan Bros. and a couple fast-rising ATP World Tour stars in American Frances Tiafoe and Brit, Cameron Norrie. Subject to change, here is the 2018 BB&T Atlanta entry list (ATP World Tour Rank is the number in the left hand column). Doubles teams will be announced at a later date. Play begins on Saturday, July 21, with the singles qualifying draw. Media Day also put the spotlight on some of the supportive tournament partners and sponsors as well as The Giving Kitchen as a the charity partner. Companies like Cigna fit perfectly with the BB&T Atlanta Open and how they interact with the community. can be purchased at http://www.bbtatlantaopen.com/. Again the tournament venue will offer more shade and air conditioned viewing opportunities. Every seat in the stadium is close to the court and sight lines are some of the best in tennis. All week long there will be sponsor activities, player autograph sessions and delicious food/drink to go along with special events like College Night, Military Appreciation Night and more. Ticket packages for the BB&T Atlanta Open, the only ATP World Tour event in Georgia are available at www.bbtatlantaopen.com. Additional players, including the wild cards and qualifyers, will be announced at a later date. See the 2018 player page.